With color A, cast on a multiple of 4 sts, +1. Row 2: With color B, knit all sts. Row 3: With color B, purl all sts. Row 5: With color B, purl all sts. Row 6: With color A, knit 2,* drop next stitch off needle and unravel 4 rows down, picking up Color A stitch from Row 1 below; insert needle into this stitch and under the 4 loose strands of Color B, and knit, catching the 4 loose strands behind the stitch; knit 3; repeat from * to last 3 sts, drop stitch, knit 2. Row 7: With color A, purl all sts. Rows 8 to 11: As Rows 2 to 5. Row 12: With color A, knit 4,* drop next stitch, unravel and knit Color A stitch from Row 5 below in the same manner as Row 6 was worked, k3; repeat from * to last st, knit 1. 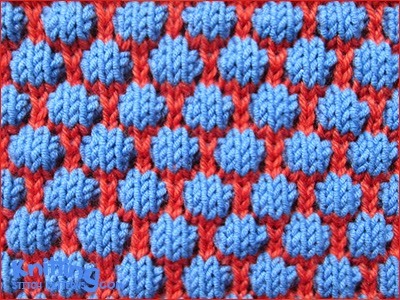 This pattern can be adapted to circular knitting by knit all the odd numbered rows.